Shelby County, created in 1792, is located in the heart of the Bluegrass Region of Kentucky. Its name honors Isaac Shelby, the first Governor of Kentucky. The county seat is Shelbyville. The county is part of the Louisville/Jefferson County, KY–IN Metropolitan Statistical Area. Shelby County is known for its beautiful country setting consisting of rolling hills and horse farms. 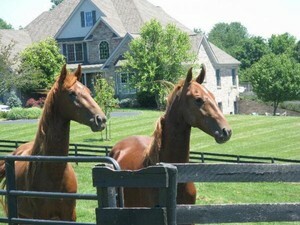 In fact, Shelby County is known as ‘’The Thoroughbred Capital of the World”. Shelby County is a popular location for those wishing to live in a more stress free and laid back environment, and with Louisville just 30 miles to the west and Lexington 50 miles to the east you are never very far from the conveniences of city living. While strolling down the streets of downtown Shelbyville you will feel as if you have been taken back in time. It definitely gives you a sense of what Mayberry would have been like. Plenty of small shops, restaurants, and other businesses to choose from. Check out the latest Shelby County real estate listings below and use our premier Real Estate Search to find your new home in Shelby County!